The ground in Green Timbers slopes gently from northeast to southwest. The main stream is King Creek, with Enver and Quibble Creeks east and west of it. The soil is generally loam over gravely clay, altenating with low, moist patches. Much of the original humus layer was eroded in the course of logging and in clearing and burning in preparation for replanting. This resulted in the root systems being shallow as can be seen from the shape of the roots of the many blown over trees. For the original planting in the thirties, the area was divided into 106 five-acre lots. Conifer (evergreen) seedlings were planted in rows about ten feet apart: Douglas-fir, Grand-fir, Western Redcedar, Western Hemlock, and trial plots of Scotch Pine and Eastern Red Pine. Deciduous trees shed their leaves before the cold or dry season. Before this the leaves often turn orange, red or yellow. New leaves appear in spring. 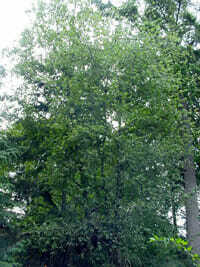 There are many different varieties and sizes Deciduous trees in Green Timbers. Ferns are delicate plants that only grow in areas where there are suitably moist conditions. They favour sheltered areas under the forest canopy, along creeks and streams and other sources of permanent moisture. 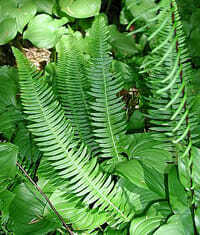 Ferns reproduce differently from the conifers and flowering plants. There are many different varieties and sizes Ferns in Green Timbers. 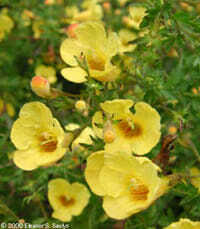 Flowers make up the “Herb Layer” of the forest. They include: White: Trillium, Wild Lilly-of-the-Valley, Bunchberry, Foamflower, Twistedstalk, and Vanilla Leaf. Red/Mauve: Fireweed, Bleeding Heart, Coral-root Orchid Yellow: Skunk Cabbage (Yellow Arum). Whitish-green: Rattlesnake Plantain. Mosses are an amazingly resilient and versatile group of plants. They range from microscopic discolourations on the soil to great shaggy knee-high carpets. They can be found in just about every habitat you can think of. 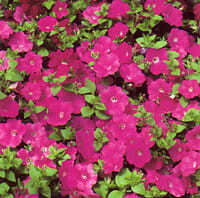 There are many different varieties and sizes Mosses in Green Timbers. Shrubs make up the forest’s undergrowth or “Understory.” They play an important role in protecting the root systems of the tall trees, regulating the water run-off and restoring the soil’s nutrients as their leaves and stems decay. Shrubs provide shelter and food for birds and other animals and add to the beauty of the forest. Common shrubs are Salmonberry, Thimbleberry, Elderberry, Huckleberry, Salal, Trailing Blackberry, and the less common False Azalea and Devil’s Club. Each wetland community has a variety of plants which provide shelter and food for many of the animals living there. Plants add oxygen to the water for underwater species. 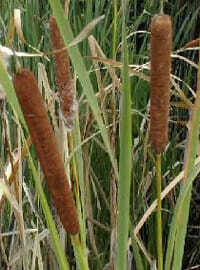 There are many different varieties and sizes wetland plants in Green Timbers. Birds prefer mixed forests of deciduous trees, evergreens, flowers and shrubs where they can find abundant food and shelter. Among the closely spaced tall trees they inhabit the high “Upper Canopy” of the forest where they feed on cones, insects and grubs. 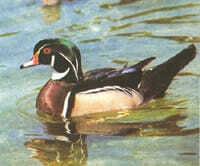 Others, like woodpeckers, choose dead snags in which they nest and probe for grubs. Many birds, like the Rufous-sided or Spotted Towhee ad Bewick’s Wren nest among the low shrubs of the “Understory”. There they can easily be disturbed and it pays to keep one’s dog on a leash. 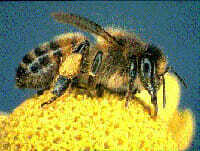 Bees, wasps, mosquitoes, dragonflies, ants, aphids, moths and caterpillars, weevils and beetles. These are all insects that are common throughout our neighborhoods. Bees, wasps, and ants make use of dead snags and stumps for their hives and nests. Aphids and caterpillars feed on green foliage and needled branches. Ground beetles attack destructive insects and grubs found under decaying leaves. Several types of tiny beetles, which bore, into wood and under bark are very destructive to forests. Unlike other animals, mammals have body hair, have 3 middle ear bones (the malleus, incus, and stapes), and nourish their young with milk that females produce in modified sweat glands that are called mammary glands. Mollusks are those animals which lack a notochord, a characteristic of vertebrates. Therefore, in order to protect themselves, they usually have a shell or a hard exoskeleton, but not always! They scavenge on leaves and organic matter. Amphibians (frogs, toads) and reptiles (snakes) are cold-blooded creatures. Unlike mammals, they depend upon sunlight and other external sources of heat, such as that reflected or otherwise supplied by soil and rock, to regulate their body temperatures.